I was a solitary child, playing alone in the shadowed confines of the garden, gathering sycamore seeds and autumn leaves and chattering to Henrietta, the girl who wasn’t there. As an adult, I discovered there had been a real girl called Henrietta who had lived and worked as a domestic servant in the vicarage that had once existed on the spot where our house was built. One night there came the sound of slow, heavy footsteps climbing the stairs. It was just mum and me in the house and we’d both gone to bed. ‘Is that you, Helen?’ she called out. I replied that it wasn’t. We’d both heard it, but neither one of us went to investigate. In my mind, it was simply the echo of the old vicar retiring to bed himself. I’d always believed that the house we lived in had been a part of the vicarage, but I recently found a picture of it and was disappointed to find that it was a much grander building that had been demolished and replaced by our little row of houses. I lived in a world of perpetual imagination. Mad scientists worked in the portacabins on the car park at the bottom of our street. I knew this because the desks were strewn with glass beakers, Bunsen burners and test tubes. Their white lab coats hovered like ghosts in the semi-dark after everyone had gone home for the night. But the most influential and Gothic element of my childhood was the Victorian mansion that stood opposite my own home and in whose grounds and rooms I spent as much time as I was allowed. It was my Green Knowe. I spent many a day dreaming up stories about the phantom children that occupied its rooms and often expected to see a leafy St Christopher striding past the high stone wall with Tolly on his shoulders. I never saw him, but that didn’t mean I wouldn’t, one day. If you climbed the grand staircase that greeted you as you entered the house and went on up to the attic you’d find a variety of dusty and cobwebbed vintage organs left over from days gone by. In the bowels of the house you’d be confronted by the giant bat that blotted out the light from the only window. The bat was a crumpled sheet of newspaper, but that’s what it looked like to me. During World War I the house had been used for the rehabilitation of sick and wounded soldiers, one of whom had made a small teddy bear whilst he waited for his wounds to heal and had left it behind when he left. I often took it down from the shelf and wondered what has happened to the soldier who’d made it or if he’d been drawn back to the house as one of its ghosts. It was here that I met the other Helen, the owner’s grand-daughter who, not only had the same name as me, but was the same age and when I think about it probably looked a lot like me too. A case of Gothic doubling! On one of her visits I was allowed to stay the night. We were put to bed in the master bedroom in a bed that was much larger than the double bed my parents had. I was too excited to sleep and spent the night scaring ‘my twin’ with tales of ghosts and ghouls and convincing her that the heavy blue drapes that covered the windows were moving in some supernatural breeze from the otherworld. When the house was put up for sale and the company over the road (the one with the mad scientists) purchased it and demolished it to make another car park I was distraught. Where would my ghosts roam now? When they cleared the garden and chopped down the trees the kestrel that made it’s plaintiff cry from the chimney each night was never heard again, the raven, that I’d nicknamed ‘Soot’ after Dickon’s pet in The Secret Garden also flew away. And here was the real horror – that someone could carelessly discard the many beautiful objects, furniture and personal possessions representing decades of memories of a person’s life without a second thought. The vintage organs, the highly polished mahogany dining table and anything else the owner didn’t have room for in her new flat in a sheltered housing complex was to be left behind and skipped. I don’t know what happened to the teddy bear. As the house came down, brick by brick, I wept. It still angers and upsets me, but the house lives on in my memory. I can still open the wrought iron gate, walk up the driveway to the porch, push open the door and stand in the hallway with its black and white tiled floor, turn left into the dining room and run my fingers along the polished table, play a few notes on the piano, pick up the teddy bear from the dresser where the patterned soup tureens line the shelves and then walk out through the white French doors down the three steps onto the cool grass of the lawn. Those French windows make an appearance in Blackfeather in Kate’s lounge. Or I can turn right into the living room and lie on the yellow chaise longue in front of an immense stone fireplace. Even the biggest Christmas tree I had ever seen couldn’t make this room feel small and cramped and it was always a real tree that shed its needles on the thick patterned carpet. Or I can walk along the corridor by the stairs, past the door to the cellar and turn into the kitchen with its beautiful cream painted cupboards, long wooden counters and Belfast sink beneath the window. The airy space is filled with sunlight and the greenhouse attached to the kitchen overflows with ripe tomatoes and fat juicy courgettes. One day this house will become the setting for a time slip romance story I’m going to write in which a young woman inherits an old house and meets the ghost of a World War I soldier. Nothing could replace Springwood House, but during my teenage years, my friends and I often visited a nearby stately home where the Fairfax family had lived during the English Civil Wars. A house this old always has more than its fair share of ghosts. The haunted room where the Jacobean cradle used to rock to the touch of an invisible hand was our favourite, followed by the mark on the floor of the great hall which legend has it was the indelible blood stain of a murder victim. I didn’t know, back then, that there was such a thing as The Gothic. It’s only through studying it as part of my degree that I can look back and see the gothic elements of my childhood and the influence they’ve had on my own writing and reading habits and my insatiable desire to know what’s behind every closed door or investigate where a spiral staircase leads. And what a glorious childhood it was, free from adult responsibility, the ability to read whatever I chose and dream for hours on end. It may have been solitary, but I was never lonely. The Ghost of a Christmas Past. It started with some old photos and postcards of Liverpool. I follow several groups and some postcard retailers who regularly post old photos of the area to Facebook and every now and then there are images of the area I live in, but these are usually of local businesses or transport. I decided I would do a quick search on Ebay to see if they had anything closer to home and much to my astonishment an image came up in the lists that looked incredibly familiar. To most people this would be just an ordinary row of houses. Why anyone would produce a photo of them for a postcard was anybody’s guess, but to me it was much more. One of those houses was mine. I clicked the link, the seller said it had been posted in 1911. I already knew the houses were built between 1901 and 1911 and had found census records for the first family to live here, but this postcard could be a direct link to those people. The reverse of the card wasn’t shown, so I couldn’t be sure who’d sent it. The chances it was ‘our family’ (as we fondly refer to them) were slim and the card was priced at £19.00. It’s the most I’ve ever paid for a single postcard, but I had to have it. What were the chances of finding another? When it arrived I opened it with fingers crossed, but am sorry to say was a little disappointed. It was not sent by any of the people living in my house in 1911 and had no identifying information on who had taken the photo or produced the postcard. That still remains a mystery, but the odd thing was that it had been sent to a place called Orrell Park, odd because that is what this area is called too. It was posted on the 4th of January 1911, the sender thanks the recipient for postcards, papers and Christmas parcel and says what a quiet New Year they’ve had with no visitors. A brief glimpse into a Christmas past. What’s interesting about the card is that it shows what the houses looked like just after they were built, and the row further on has changed considerably because they are now all shops with flats above. But the best thing for me is that if you look really carefully (and I have, with a magnifying glass), it appears that there is someone standing at the upstairs window, holding the curtain back and watching as the photographer took his photo. And just to the right of that the other window is open and possibly has another figure watching from there too. I could be wrong, but I’d like to think this was the lady of the house and her fifteen year old maid, Emily Francis, who we believe still haunts the house, as she has been spotted in her uniform on a few occasions. What’s All The Fuss Over Harry? A couple of months back I discovered that ITV were going to air an adaptation of Neil Spring’s excellent book The Ghosthunters. Like most purveyors of the paranormal I couldn’t wait. 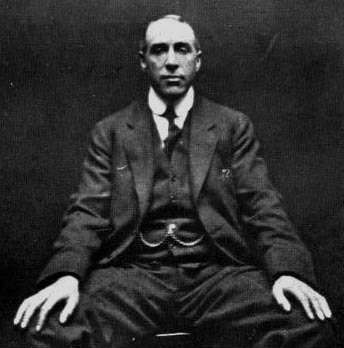 I’m not an expert on the life and weird adventures of Harry Price, but any follower of the Fortean has heard about him and knows of his connection with Borley Rectory – The Most Haunted House in England (allegedly, and I would argue up for debate). I remember reading a book on the hauntings at Borley many years ago, by whom, I can’t remember, but it made an impression on the younger me. So it was with some trepidation that I sat down to watch the ITV offering and was prepared to shout at the screen if need be. I’m not sure what other people have been watching, but all in all I quite enjoyed it and didn’t see the contentious Harry as fraud element that others saw. The biggest inconsistency for me was that Rafe Spall looks nothing like Harry, who had a lot less hair and a much stranger, but oddly mesmerising face. What ITV have done, with Mr Spring as consultant, is weave an entirely fictional tale, that, as far as I’m aware, bears no resemblance to any case that Harry Price ever worked on (again, please correct me if I’m wrong). And when you realise this it’s much easier to let go of the preconceived ideas and expectations and just enjoy the 2 hour long period drama for what it is – the traditional ghost story at Christmas that has been served up by TV and newspapers alike for the last 2 or 3 hundred years or more – please go and read some of those published in the nineteenth century press. M. R. James they are not! OK, so back to ITV, the ghostly effects weren’t particularly spooky, but the whole thing is based on the fact that the ghost is a result of chemical poisoning used by the disgruntled husband to punish and get rid of the unfaithful wife. The mistake was to use Harry Price as the ghosthunter. Had ITV made their paranormal investigator an entirely fictional character, left out any hint of connection to Harry’s real life associates (Lucie Kay(e) alias Sarah Grey and Vernon Wall etc) no-one would have batted an eyelid. I for one hope they continue it as a series, perhaps using some of Price’s documented investigations – Borley, of course, or perhaps Gef, The Talking Mongoose?? This is The Dark Hedges in Ballymoney, Co.Antrim, Northern Ireland. Originally planted by the Stuart family as an impressive approach to their home, Gracehill House, the trees are now over two hundred years old. The lane is said to be haunted by The Grey Lady who glides silently through the trees until she passes the last beech tree, whereupon she fades away. It reminds me of the country lane that Kate is driving down after rushing from the church with the strange box she has found in the church (Blackfeather, Chapter One). Imagine travelling down here when a mysterious figure suddenly appears in front of your speeding car and unable to stop in time you drive straight through him.